High-gloss Carhartt stickers for indoors or out. Dedicated to those who outwork them all, these Carhartt stickers give you a way to show it. They're proudly using high-gloss vinyl that does well indoors or out. I really like the stickers! I think Carhartt portrays them accurately as compared to how they look on the webpage versus in your hand. Smaller than I thought they would be but still great! They are amazing. I have them on my laptop, iPad, water bottle, and a window or two. And I have no doubt I will be ordering another sheet. These stickers are printed on quality gloss paper. They don't peel after placement. We have stickers plastered everywhere on the truck or in the garage. Just a little obsessed I'd say. Exceeded my expectations for quality of construction and appearance. I love collecting stickers, and the addition of these made it better. The quality and color are amazing. Put some on you're laptop to make it look amazing! Put them on the truck and also on cups! These were given as Christmas presents to my daughter's family in AZ. They love them and will put them on their cars, truck and hard hats. Buy them, you can't go wrong. Carhartt is hands down thee best clothing to work with, thee most durable for the price, ALL Carhartt products are built to last! As it appears on the Web site nothing different. I bought these just to throw a couple onto my Snap-On tool box. I like the variety, but I had hoped they were a bit bigger. I will say that these stickers are of an amazing quality. Well I am a Carhartt fan so had to buy these. Put them on my welding helmet and tool box and a couple other places in the shop. Good variety of stickers. They have stayed on everything I have stuck them too. Very durable and clear. It's nice to have sticker the shows support for an American brand name that's has durable clothing. BEST ANSWER: We expect to receive stock by the end of the month. 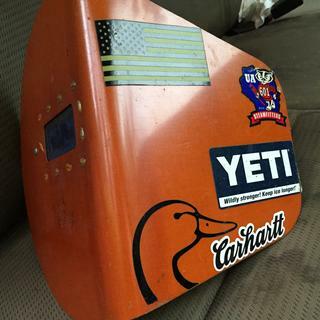 How can I find more Carhartt stickers?